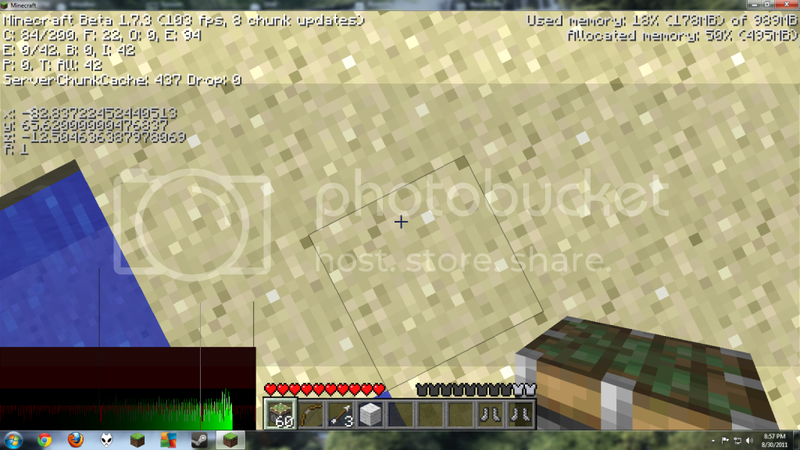 home Home arrow_right Forums arrow_right Minecraft arrow_right Discussion arrow_right How much FPS do you get? I get any where from 40 to 105. I think about 70 is my average. I get about 100, or aboot 120 in Canada, eh?. 15-25, 30 if staring at one block like you guys. Thats with a lot of stuff running in the background and hosting a server at the same time, that was actually from playing on my server. I get around from 70 to 120 FPS I might get to 130 and 140 if i have nothing else running. I guess the only downside to macs aside from price is well price.... everything is pricey.... software is pricey... well software that isn't normally for makes is usually pricey for it. I do like the finder function on makes, works better than the search tool on windows. Granted I got mine with some discounts for college so it wasn't as pricey as it could have been. I'll be honest though, I use a mac.... sure more expensive for getting less than what I could have gotten with a pc, but meh, it like how stuff in macs are set up. That being said, a month after I got my mac,... a newer version of the same laptop I got was released.... the newer one could have 4G of ram, had a nVidias graphics card integrated into it, and had about 2.5 or 2.7 of processing speed. Made me angry to say the least. I get around 30 to 40 fps normally, because one I only have a gig of ram, and second my graphics card is a integrated one that is neither a nivida or geforce. I dunno, its actually some intel integrated graphics card... well its not to bad at least, but I know I won't be able to play anything above 32x resolution though without some major lag/fps drops. i can't get any screenies since at 1fps it doesn't take it straight away. my minecraft kinda lags when I use fraps if thats wat you mean. I get 2 fps. Its pretty cool. block_main I get any where from 40 to 105. I think about 70 is my average. http://img263.imageshack.us/img263/9919/java2011083112245791.png Click the link for the full image. Good job, you posted one lower than mine, i don't think you read every post. God I hate that card =.= yes I own it and have it installed..
Now post your win on facebook or something. make your screen tiny and turn everything on it's lowest and run it at highest process, and turn off gui and then hit gui and the fps button and take a screenie at the same time. hit the button in between close and minimize on ur minecraft, drag the corners of the window to make it really small, make sure nothing else is running, use task manager and set the priority of minecraft to high, set all the video options to the lowest possible setting, put fog all the way up, encase yourself in blocks, look straight down, hit f1, wait a few seconds, hit f1 and f3 at the same time, and press f2 really fast to record a screenshot of the epically high framerate. I'm off to try to beat you.